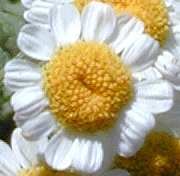 Native to Southwest Europe where Feverfew's beautiful simplicity belies its value as a medicinal herb. 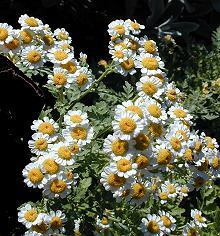 Ornamental as well as useful Feverfew is a wonderful self seeding plant that naturalizes large areas well. According to The Encyclopedia of Herbal Medicine, it was the wife of a Welsh doctor who discovered Feverfew was good for Migraines. She apparently suffered for 50 years before using Feverfew. It is now also being investigated for use in the treatment of Rheumatoid arthritis. One step at a time. Always consult a qualified practitioner before treatment. Feverfew would make an nice addition to our English Cottage Herb Garden Six Pack.